Erigeron speciosus (Lindl.) DC. (Lindl.) DC. Perennial herb from a more or less branched stem-base; stems erect, usually several, branched, glabrous or sometimes slightly hairy or glandular in the inflorescence, 15-80 cm tall. Basal leaves oblanceolate to broadly spoon-shaped, narrowed to winged stalks, 5-15 cm long (including the stalk), 0.4-2 cm wide, entire, margins fringed with small hairs, glabrous or sometimes with a few hairs along the main veins, usually withered or deciduous by flowering time; lower stem leaves similar to the basal leaves, middle stem leaves as large or larger, narrowly lanceolate to broadly egg-shaped, abruptly sharp-pointed or sometimes obtuse, unstalked, somewhat clasping, occasionally minutely glandular. 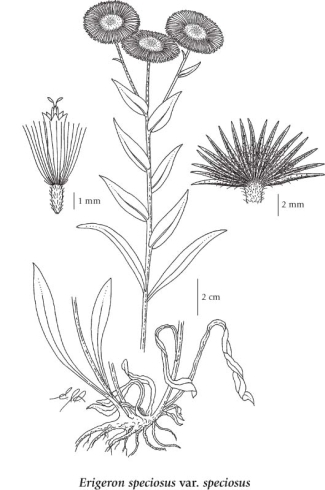 Achenes 2- to 4-nerved, hairy; pappus double, the inner of 20-30 bristles, the outer of shorter bristles. Moist to mesic open slopes and forests in the montane zone; common in S BC east of the Coast-Cascade Mountians, less frequent northward and west of the Coast-Cascade Mountains; E to SD and S to AZ and NM. Erigeron speciosus var. speciosus (Lindl.) DC. Erigeron speciosus var. typicus Cronq.